Lorna Finman isn’t technically a rocket scientist, but she’s pretty close. Her PhD from Stanford University is in physics and her company, LCF Enterprises in Post Falls, Idaho, manufactures radio amplifiers and jamming devices that our military uses to disable IEDs and roadside bombs. When their children were younger, Dr. Finman and her husband Paul (who has a doctorate in electrical engineering, also from Stanford) began looking for ways to instill a love of science in their boys. Outside of school, there weren’t many opportunities to learn about the so-called STEM programs. STEM programs focus on Science, Technology, Engineering, and Mathematics and are, both Drs. Finman contend, crucial to the advancement of society. As Lorna says, “There just weren’t many options for young children to learn about these disciplines.”Frustrated by the lack of STEM-based programs available, Dr. Finman decided to create her own version of a summer camp dedicated to bringing young people experiential, hands-on discovery of STEM disciplines. 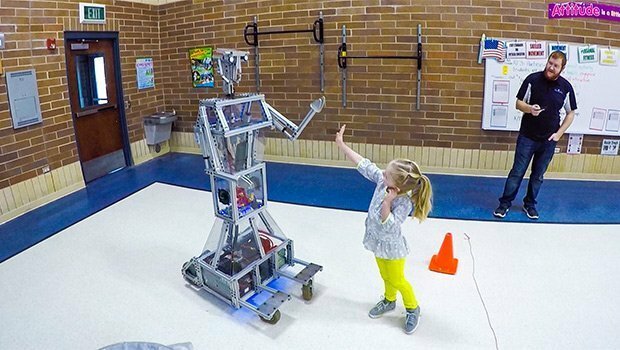 In 2007, Dr. Finman approached her oldest son’s teacher and talked to her about teaching her son and any others who were interested about robotics. Those first robotics classes sound like the beginnings of any tech company startup in Silicon Valley. In addition to robotics, Dr. Finman began organizing classes around the other STEM disciplines as well; programming, science experiments, electronic circuitry, and more. Demand from parents eager to expose their children to these programs caused Dr. Finman to examine their model a little more closely and explore ways to expand their reach. “We toyed with the idea of a science center, but we were having so many battles with permits and costs that we opted to create a mobile science center,” she explains. Thus was born Discovery Technology. With the help of sponsors and a sizable investment of her own, Dr. Finman purchased a 60-foot-long bus and equipped it with the latest technology that offers classes on everything from bio-tech to video game programming to robotics. The Discover Tech bus now travels across the state of Idaho all summer long offering children of all ages a chance to discover an exciting new world in a unique way. The mission of Discover Tech is to lead students down a path of discovery that takes them along a natural progression of “I like this…” to “I can do this…” to “This is important to me…” Dr. Finman hopes that as children experiment and play in the STEM programs a love of the new will propel them along and ultimately shape their own future.